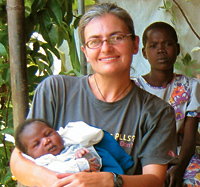 Jane Coyne '96 with friends in Uganda. The baby girl was christened Jane, in honor of the Kellogg alum. Jane Coyne isn't trying to martyr herself, but in her work as a logistician for humanitarian relief organization Médecins Sans Frontières (MSF), the Kellogg School alum has been a lot closer to danger than most MBA graduates. That's because Uganda, Sri Lanka and Nigeria have been Coyne's home for months at a time over the last three years. She's become much more comfortable with insects and snakes, been evacuated from the bush when Ugandan rebel paramilitary troops drew too close, and has occasionally been forced into a grueling around-the-clock emergency mode. Until recently, when she took on a role in MSF's New York offices, she had lived out of a backpack for two years. "I'm an outdoors person, athletic, pretty simple. Conditions that might be hard for others just aren't hard for me," says the soft-spoken Coyne '96. That constitutional disinterest in creature comforts, along with "incredibly compelling" work, most recently in Nigeria where the team cared for 13,000 malnourished children, explains some of the reasons why Coyne has directed her management talents to MSF. "This experience has, by far, been the most satisfying use of my energy," says Coyne, whose career has included consulting gigs, a Hewlett-Packard job and running her own business. MSF has taken her far from the erstwhile dot-com glitz of her Bay Area roots. In 2003 in Uganda, for instance, Coyne led a team running a water system for a village that, almost overnight, grew from 3,000 to 30,000 people. "But it still had no infrastructure: no water, no phones, no lights," she says. "The bane of my existence was water pumps that had no spare parts." The locals held Coyne and her team in esteem. "For these people water is life," she explains. In Nigeria last year, she helped manage a huge operation to provide medical treatment and food — some 15 tons a day — under sub-optimal circumstances that included the watchful eye of a government often more concerned with getting MSF out of the country before anyone could make unfavorable comparisons to Niger, the poorer neighbor to the north. The situation put the MSF team "on pins and needles," says Coyne, but they worked with local health ministers who understood the mission's importance in treating post-measles malnutrition. Today, Coyne is working on a project to improve emergency shelter. The situation allows her to remain closer to family, including her ailing mother, the original inspiration for Coyne's volunteerism. She tries to balance her passion for giving back to others with her own needs, and admits it's difficult to move between these worlds, especially since she enjoys the challenges of managing a large, multicultural staff engaged in life-saving efforts. The MMM graduate in her is also satisfied by the work. "My last mission, I probably spent five or six hours a week trying to fix generators or trying to put a carburetor back together," she says. "For me, this is the perfect opportunity because I'm kind of a geeky, mechanical person." Back to "The ultimate ROI"